By Armored Textiles, Inc. based in Peterborough, NEW HAMPSHIRE (USA). By Alphastrut Ltd based in Livingston, UNITED KINGDOM. Delivery hose for aggressive chemical products as per EN 12115 specification. For further information, please check the chemical resistance table at the end of the catalog. Fire & Water Supplies can supply the industry recognised Type 1 Layflat Hose in both the UK and internationally. The Atlas Type 1 is a high quality uncoated fire hose commonly used by firefighters and the marine sector. Our fire hose reels are a popular product utilised by a variety of industries and sectors. They are commonplace in business premises as part of general commercial fire safety planning. Our Automatic Fixed and Swinging Hose Reels are designed to provide a controlled water supply to suppress any potential fire risk situations. As the biggest unit in its range, the COLDMIST DUSTKILLER™ can cover up to 1,950 square meters. The fine mist created by the unit captures airborne dust particles and drives them to the ground, helping you adhere to the toughest air quality standards. By BKB Dust Suppression Solutions based in SOUTH AFRICA. KILLFIRE Breeching Inlets are installed in front of building where fire engine are accesible to feed water into riser systems via their Ø21/2” fire hoses. Riser systems of Ø150mm are installed with a 4 way breeching inlet that are manufactured and tested BS 5042. By Asiatic Fire System Pte Ltd based in Singapore, SINGAPORE. We execute fire protection and fire detection system on Turnkey basis including complete Design / Engineering as per applicable and universally acceptable Codes and Standards. We design Fire Protection and Detection System as per NFPA (National Fire Protection Association) and TAC norms. Burn control skid units range in size and configuration. Any skid unit can be outfitted to meet your needs. By Ag Spray Equipment based in Hopkinsville, KENTUCKY (USA). 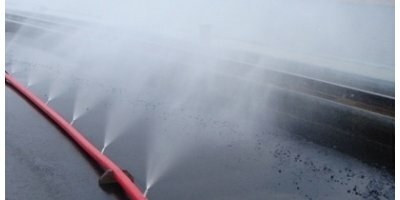 Manufactured to the same demanding standards as Duraline fire hose, Duraline Hi-Vol offers an efficient means of rapidly delivering critical water supplies in emergencies when water resources are limited or even non-existent.